Looking back to the late 00’s, fans of pop punk, punk rock and ska will fondly remember The Get Happy Tour; Bowling For Soup’s touring package that brought together bands like The Bloodhound Gang, Zebrahead and Army Of Freshmen, and of course Bowling For Soup themselves. Now, a decade on from the original Get Happy Tour, Bowling For Soup are delighted to announce The Get Happy Tour 2018! In bringing The Get Happy Tour back to the UK, Bowling For Soup have decided to give their fans what they’ve been asking for for many years. For the very first time, Bowling For Soup will perform their smash hit breakthrough album Drunk Enough To Dance in its entirety. Fans have been clamouring for a Drunk Enough To Dance “anniversary” tour ever since the album turned ten back in 2012, and now the time has come. With the hit singles Punk Rock 101, Emily and Girl All The Bad Guys Want, as well as longtime fan favourites like Cold Shower Tuesdays and Runnin’ From Your Dad, Drunk Enough To Dance is the album that brought Bowling For Soup to the fore in the early 00’s pop punk scene, a scene where they’ve remained favourites ever since. Joining Bowling For Soup as special guests on the new Get Happy Tour will be US rock superheroes The Aquabats! Being renown for a brilliant, comedic live show, The Aquabats! 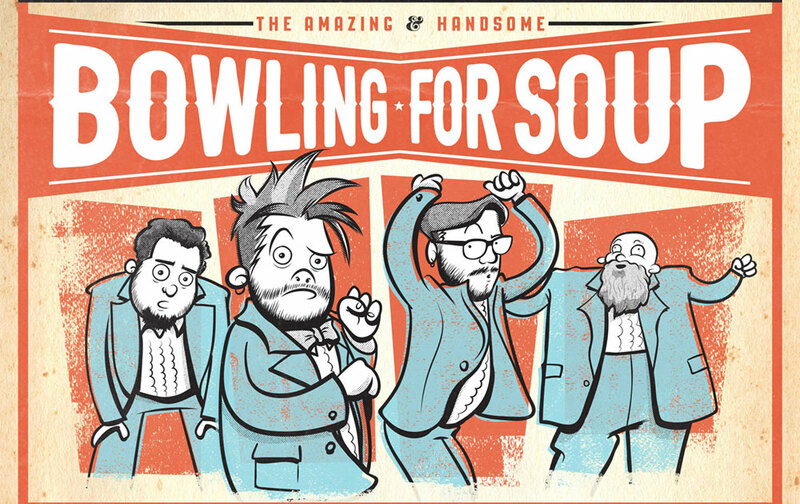 style makes them ideal touring partners for Bowling For Soup. The Aquatbats! invite you all to join their band of costume clad crime fighters in the pursuit of all things radness as they head to the UK for the first time in five years as part of Get Happy 2018. Opening up the 2018 Get Happy Tour will be original Get Happy Tour alumni Army Of Freshmen. Celebrating their 20th anniversary as a band, Army of Freshmen want to celebrate this notable achievement in style, and are also planning to play one of their most popular albums in full by performing Under The Radar from start to finish. How do you get tickets for Get Happy 2018? Let us tell you! 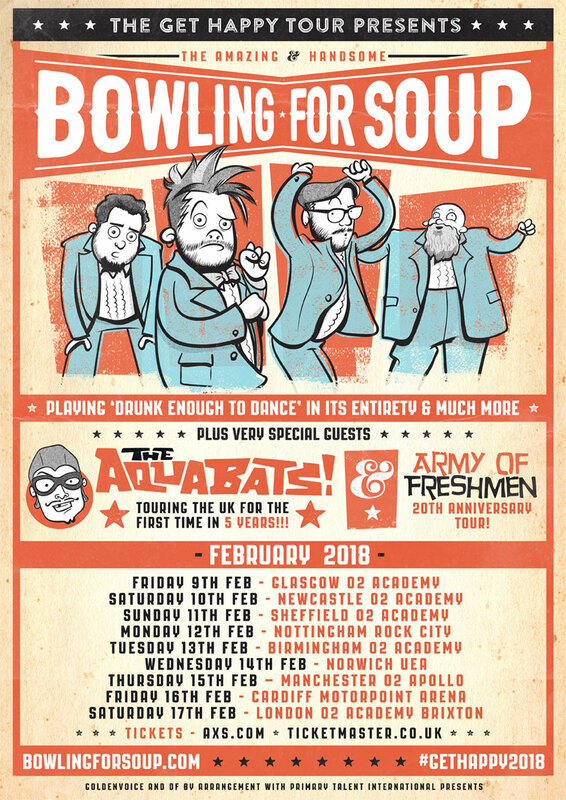 The first chance to get tickets will be The Bowling For Soup Fanclub VIP pre-sale, which will take place starting 10am on Monday 25th September. For more information, please visit www.bowlingforsoup.com. The general on sale will begin two days later at 10am on Wednesday 27th September at AXS and Ticketmaster.